This video reports on research by the Cooperative Research Centre for Young People, Technology and Wellbeing in Australia which has shown young people are much better prepared to deal with online risks than adults presume and that young people themselves are the most valuable resource for adults concerned about the online safety of their children. The research also reveals significant benefits to young people through social networking, which helps them to build relationships with the world around them and increases their sense of community and belonging. I particularly like the research approach. “In the Living Lab we inverted the usual power relationships that underpin cybersafety education. Instead of charging adults with the responsibility of educating young people about cybersafety, we put young people in charge” says Dr Amanda Third. Thye social web – a huge shopping mall? The Facebook privacy arguments won’t go away. In part this is because as a society we are having to rethink what we mean by personal privacy and how much we are prepared to live our lives openly on the net. And it is also in part because Facebook are keepi9ng the pressure on for ever more disclosure of data. last weekend Facebook announced that it had expanded the information users are able to share with external websites and applications, to include home addresses and mobile phone numbers. True, this had to be authorised but as is often the case the interfaces for doing this were less than clear. In the event Facebook backed off and on Monday announced they were rethinking this feature. But they will be back. Facebook’s future – if it is to meet the increasingly inflated aspirations of its “incentivised” investors – is to use a combination of its scale and the acres of intimate information it holds about all of us to find the real money in targeted advertising. The strategy is to gradually open our personal data more and more, making open information the norm, desensitising us to any uncomfortable feelings we might have had about our personal data being released into the wild. And in turn Facebook’s incentivised investors are driven by the aspirations of Facebook to control the social web and eat into Google’s search driven advertising revenue. This raises a big question. If ‘social’ is indeed the future of the web, do we necessarily have to give over control to a bunch of investors. Is the web just to become one big shopping mall. Or indeed, is that what it is becoming already? Posted in Digital Identities, On-line safety, Social networking, Social Software, socialmedia, socialnetworking, Wales Wide Web | Comments Off on Thye social web – a huge shopping mall? Over the last two years I have been lucky to work on a project called Rhizome. Rhizome is a research and development project, funded by Eduserv, exploring the key social and technical elements that impact on the construction of online identities. 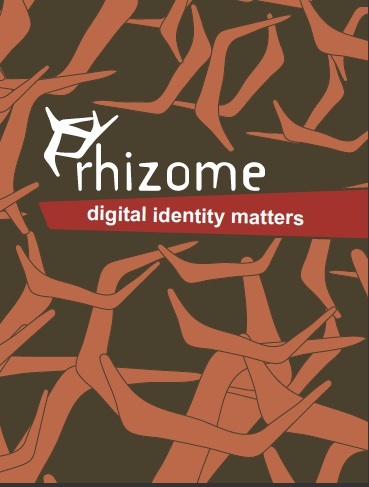 The Rhizome awareness report, published today and entitled ‘Digital Identity Matters’ highlights the issues we face when dealing with our online identities. It outlines the design pattern approach that has been used to help define a set of problems and their solutions that all relate to our understanding and use of a digital identity. The material is released as an open access resource and is aimed at contributing to a deeper understanding of digital identity and the impact it can have on the individual and those around them. It will be of relevance to anyone who uses the Internet to disclose personal information about themselves – be it purposefully through the use of social media tools or as a result of work-based professional activities. The report can be downloaded from the Rhizome project web site. The following text is an except from the introduction to the report. “Our relationship with the Internet is changing. Mobile devices, wireless connectivity, and our increasing virtual presence across multiple social media services have all but collapsed the boundary between being online or offline. Together the virtual and the real form the seamless space in which many of us live out our daily lives. We fashion the self through social interaction, community and network affiliations, and here come to construct our identities as well as interpret the identity of others. The ease with which individuals can now produce, reproduce and distribute digital content has powerfully shifted the ways in which we think about global connectedness, media access and distribution, social action and the production of knowledge. Our ability to engage so readily with digital media and online networks is empowering but our resultant actions also make us vulnerable. We suffer the pressures of information overload, time management and, as we argue in this publication, the need to curate our increasingly visible digital lives. The Internet is not a set of static objects but a dynamic network of connected, interacting subjects. How does our online visibility affect who we think we are and our ability to act with purpose and intent? How should we ethically respond to concerns about the impact of one person’s online behaviour upon the lives of others. These are two of the questions that are explored here. We focus on a design pattern called ‘Putting Children First’ and two supporting case-stories that describe the dangers of using an online photo-sharing service. Together they illustrate the complexities of negotiating our responsibility to others when we are in the process of developing our own digital identities. This pattern offers a design solution for using social media in a thoughtful, literate and ethically responsible way. I was greatly inspired by the Wise Kids conference on Young People in a Digital World – Preparing, Inspiring and Supporting, held in Bangor in Wales on Wednesday. This was the second of two regional conferences, with videos from the first, in Swansea earlier in the week are available now online (the video by Tanya Byron, who advices the UK government on internet safety is encouraging from a policy point of view). Here are a few impressionistic comments which by no means express the breadth and quality of the event. Two things which particularly encouraged me. The first was the breadth of organisations represented by participants. This included teachers, local government officers, youth workers, researchers and delegates from internet and software companies and the voluntary sector. The second was the active involvement of young people themselves in the conference. And for me, the highlight was the youth panel of some ten or so students from Ysgol Trfyan. They were thoughtful, articulate and above all opinionated. Having previously presented a Welsh language drama about e-safety, they went on to answer questions from participants in the conference. all but one said that if they were forced to choose they would give up television rather than the internet. But there main message was their opposition to the ban on accessing social networking sites and particular Facebook from school. They said the reason they had been told for the ban was that social networks had been used for cheating in exams (unlikely as I found this, a report in last weeks Guardian claims the use of mobile phones for cheating is on the increase!). However they could not see why Facebook has been banned when there was still access to other sites including games. “Facebook is better for learning than games”, said one. Another said: “Whatever they ban we will find a way around it:. And although there may have been an element of campaigning going on, when asked what site they accessed first when they went on the internet, nine said Facebook, one YouTube, and one shopping. Members of the panel has obviously researched the question of e-safety in some depth in preparation for their drama performance. However, whilst they felt schools should do more to teach internet safety and that also parents should pay more attention to what their children were doing on the internet, they were against nanny programmes. They were also dubious that present age restrictions of access to sites like Facebook were working. One member of the panel said that if her younger sister insisted she was going to set up a Facebook account,, despite being under 13, at the end of the day it was pointless to try to stop her but instead she would try to watch out for her sister’s safety! The issue of safety tended to overwhelm the conference. As chair Alan Davies said, we seemed to be doing a lot of preparing, and supporting, but not so much inspiring. Especially in the workshop sessions there was a lot of inspiring. I enjoyed the presentation by Rebecca Newton on Moshi Monsters. But my favourites were the workshop sessions by John Davitt – Occupy the Hand and Mind – simple strategies to make learners active with New Tools – and Leon Cynch‘s brave exploration of the suddenly unfashionable Second Life. However these sessions were very much geared towards teachers and trainers. There is a big gap – a gap between what such pioneers as John and Leon are doing and the reality of what our systems administrators and school managers are allowing. And it is that gap which was so eloquently exposed by the students from Ysgol Trfyan. The issue of firewalls, white lists and so on is not an administrative issue. If education is to keep in touch with the way young people (and older people too) are exploring and using the internet for learning, for work and for play, then we have to rethink the present absurd policy of banning social software. Yes, online safety is an issue. But Wise Kids has shown that internet safety is computable with open systems and that educating young people is a better policy than policing them. These are the slides from my presentation from the excellent session on Digital Identities at the Online Educa Berlin conference held earlier this month. Last week I welcomed Facrebook’s announcement of new fine grained access controls which they claimed would allow users to decide what and iwth whom they wished to share. “We’re making some changes to give you more control of your information and help you stay connected. We’ve simplified the Privacy page and added the ability to set privacy on everything you share, from status updates to photos. The new controls are far from simple. And after an hour playing with them it appears they provide far less potential privacy than the original settings. Name, profile picture and as far as I can see your personal wall is set to public and cannot be hidden. So what is behind this? Is Facebook really concerned to protect privacy. It seems a bit too much of a coincidence that the new settings were launched a week or so after the announcement of deals with Google and Microsoft to provide Facebook data for real time search (just an aside – what is the value of real time search – I don’t get that one). I might be paranoid but I suspect the real point of the new controls is to make sure data is available to the search engines, rather than allowing users more control over their own data. In the discussion over the new settings in the Guardian yesterday, some commentators asked why so much fuss given that it was a free service. Well firstly is Facebook really free. We provide our data which makes the site valuable for advertisers who pay Facebook. That doesn’t sound so free to me. The question of access controls will not go away. Digital identities are becoming increasingly important especially for young people. A couple of weeks ago a Romanian CEO of an advertising agency said in a confernce I was at that he would not hire anyone who did not have a good digital identity. Our on line identities are fast replacing the traditional Curriculum Vitae. We have a situation where the main spaces young epopel use to meet. communicate and share their lives together are controlled by private companies who are claiming ownership of our data. That is not a minor issue. OK – we can delete our accounts (although then Facebook still retains the data). But young people are not going to do this. Regulation is probably the only answer, although it is hard to regulate international platform providers. And of course, education on not just digital safety but education about the importance of digital identities and how to develop and manage them. In my next post I will post a report for the EU ICONET project on a great course developed at Salford University and looking at digital media and identities. Online- Educa Berlin tends to be one or two years behind the research in Technology Enhanced Learning. But it is a great indicator of what technologies and ideas are mainstreaming. This year there is little or no discussion of Virtual Learning Environments: all the talk is of the use of social software for learning. And with that discussion, comes concerns over users control of their own data, of data security, of privacy and safety – and of course issues related to digital identities. In this respect, it is very good to see Jerry Zuckerberg’s open letter on the future of Facebook, pledging to provide greater and more fine grained control for users over who can access their data. However Zuckermann’s letter, or rather the responses to it illustrate one of the big problems facing Facebook. At the time I looked at it, it had 33858 comments. And, as far as I can see, the vast majority were spam (see selection above). 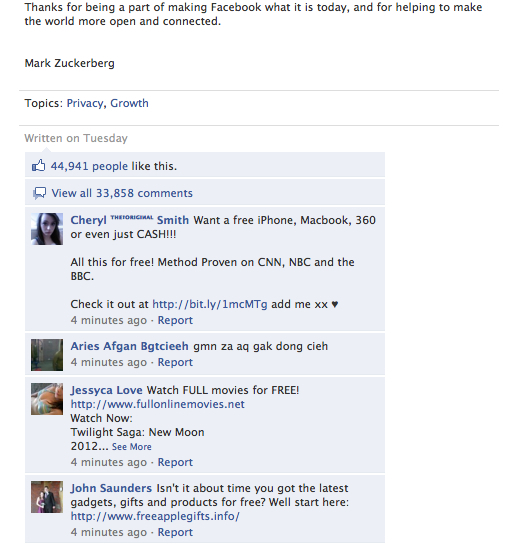 If Facebook cannot provide Jerry with user controls to prevent spam, what hope is there for teh rest of us? We have been writing a lot about ideas on how mobile devices, and particularly phones might be used to support learning. But most of this work has been from a somewhat theoretical angle. Now Jenny Hughes has written a great guest blog on the practical work she has been doing on the use of mobiles in schools. “I’ve been working with (primary and secondary teachers) on e-learning in the classroom – particularly the use of web 2.0 applications – as the roll out and dissemination of the TACCLE project. Part of this has been looking at the use of mobile phones as learning tools in schools. There seems to be a lot of debate around the technology, the theoretical perspectives, the social dimension and so on but just at the moment the ‘doing’ is engaging me far more than the research. And as I’m always the first to complain about the practitioner – researcher divide, I thought maybe we should contribute by sharing some stuff we are experimenting with in the classroom. What follows is some of the output from teachers. Firstly there has been a debate around the feasibility of using mobile telephones in schools; teachers from schools that have banned them outright, teachers from schools where they are allowed and teachers who are actually using them for learning generated a list of For-and-Against arguments. Secondly, there are some practical suggestions for using mobile devices (mainly phones), tried and tested and either contributed by teachers or trialed on the TACCLE course. Non-filtered web access that can be used to spread content that some parents do not want their children exposed to. Privacy issues with teachers having personal phone numbers of pupils and vice versa. Have and have not situation – some pupils will not have them, some will not. Some will support less applications than others – need to work at level of common denominator. Cost implications for pupils and their parents – not just the cost of the hardware but the cost of use. Many pupils on ‘Pay-as-you-go’. If pupils are going to have them in schools anyway, irrespective of whether it is officially allowed, they may as well be exploited for learning. Overcomes some of the problems of ‘distraction’ etc. Pupils can ask questions of the teacher they may be too embarrassed to ask publicly. Encourages engagement e.g SMS polling can ensure every pupils voice is heard. Firstly, a few ideas about using the phone itself – rather than using it as a communication device. Pupils can customize the wallpaper on their phones using something like pix2fone or pixdrop. Either the teacher can ask them to take a picture with their phone around a particular theme or can send everyone in the class a picture she wants them to study / talk about to use as wall paper. This could be a photograph or a key message or reminder of some learning point. Pupils can create ring tones using e.g phonezoo. They create the ‘tone’ in Audacity, Garageband etc and export to phonezoo which then sends it back to mobile phone where it is saved as a ringtone. We tried making up jingles for a particular topic, key dates for a history test, a poem to be learned for a literature test, a foreign language phrase and lists of chemical elements in a particular group in the Periodic Table! Using their phones to access podcasts. Some mobile phones can already subscribe to podcasts and a fair few can listen to streaming MP3s from the Internet. Even if these features are missing, pretty much every mobile phone you can buy nowadays can be hooked up to a computer and have MP3s sent to it to listen to on the go. be in different places working on the same project and be talking via instant-messaging. Our example was a history ‘Treasure Hunt’ where groups were competing to find objects and information. The groups split up and group members updated each other on progress using mobile phones. recording science experiments and including the pictures /video with their written reports. Using twitter. History teachers chose a period in history (was the second world war) and had groups of evacuees, host families, parents of evacuees back in bombed cities sending messages to each other about their feelings. Use twiddeo to upload video made on mobile phone to twitter. Make a tee-shirt using Reactee on twitter that you can wear in the classroom. Ours was a line to ring to get homework assignments and deadlines. Making slideshows for mobile phones You can make slideshows for mobile phones. It’s easy but you need a few basic techniques (which we can share if people are really interested.) We made ‘revision’ slideshows which each teacher could produce for their subject area to be viewed on mobile phones. Brainstorming using wiffiti. We found wiffiti is a wonderful way of getting pupils to create a communal, real time visual brainstorm, on a screen, from their cell phones. Making simple Stop Motion animations. Take lots of photos on a mounted mobile phone e.g of a Plasticene model or bendy toy then import them into a slideshow presentation and set the show to change slides on the fastest (e.g 1 second) autochange. We did pictures of a the notes of a simple tune drawn with felt pen on an A1 sheet then ‘moved’ an arrow to each note in turn so that the pupils could see which note was being sung. For those students with Bluetooth, a natural progression from students e-mailing homework or assignments might be to get them to send it by phone to your laptop at the beginning of a lesson. In the educational technology community we have talked about social networking from a learning perspective. How can social networking promote the development of personal learning networks? What is its impact on the formation of digital identities. How is knowledge developed and shared? Can we trust commercial companies such as Google to provide critical infrastructures for learning? We have tended to ignore the commercial side of the business, hoping at least that providers seek ‘to do no evil’ in developing their services. Michael Arrington’s blog post, Scamville: The Social Gaming Ecosystem Of Hell, and particularly the comments on the blog, reveal another side to the business and a totally different discourse – ‘virtual goods business’, ‘seeds’, ‘CCT’ ‘credit card transactions’, ‘offers’, ‘revenue streams’, ‘virtual gifts’ and ‘CPS’ (cost per share). Arrington alleged that many of the advertisers, who appear to the central to the whole Facebook operation, are targeting users of popular Facebook games, such as the popular Farmville, with seemingly innocuous offers to gain extra game points which in fact tie them in to expensive credit card subscriptions. At best, the terms and conditions of service are contained in the small print. And, from reading the comments – see for instance this comment, it appears that such practices are almost impossible to avoid for perspective Facebook developers seeking to ‘monetize’ on their products. Indeed it is the whole language of the discussion which is most shocking. This is another world to our discourse around social networking. Social networking here, becomes a world of cut throat primitive accumulation of capital, where only the most ruthless and cynical survive. So where do we go now? I remain convinced of the value of social networking for learning. But we cannot trust the commercial platform providers to have the same interests as us (and before you accuse me of scaremongering please read the comments on Arrington’s blog). At the need of the day, we need to promote distributed platforms and infrastructures (such as Buddypress) which we, as an educational community, can control. We need to continue to develop and support open standards. And we need to consider how social networks can be properly regulated. Lets return to the Facebook dilemmas. Why am I so hung up about this at them moment? Its because though some empirical research I am doing at the moment – and from talking to friends and colleagues – Facebook seems to be playing increasingly important role in their lives and digital identities. And it is not just their online lives – Facebook is bridging the physical world and day to day social interactions within the digital. especially for young people, what they are talking about at school is what their friends have been saying and doing on Facebook the previous evening (or night as it seems to be for so many people). And of course from another perspective – the online discussions are based often on face to face social encounters. Thus the widespread adoption of Facebook as a part of peoples everyday lives exposes issues around social networking – issues which have not been sufficently studied and which pose dilemmas for us as researchers and as a society. On the other had I have talked to people, young and not so young, deeply unhappy about images posted and tagged by others with their names and about which they knew nothing. With the present Facebook settings anyone is free to upload any picture of another person and tag them. Yet these images form an integral part of our digital identity and are an area over which we have little control. this can be of considerable distress to teenagers who may be concerned about their appearance, or indeed to adults. And as previous studies have shown it is remarkably difficult to get an image erased from Facebook, once it has been posted. Equallyworrying is that the present Facebook tagging system makes it very easy for many people, whether friends or not, to access photo albums. Facebook does have settings, which allow for more privacy. But the default settings are remarkably open: it probably is simply not in Facebook’s interests to discourage more restrictive settings. And how many people know how to change their privacy settings in Facebook. I am all for openness, open education, open discussions, open knowledge and a culture of sharing. Yet as digital identities become ever more important, it is critical that we have the rights and the tools to manage that identity and that social network providers appreciate and support those rights and make it easy for individuals to understand how they can mange both privacy and openness. This is an issue which will not go away.